Written in 1929, the first year of the Depression, “Bad times:” is as skeletal in form as a starved body. Its first line’s ironic understatement, the sorrowful presence of the culture industry and the faint heartbeat of capital circulation all feature in the poem, however dimly. Other, marginally less bleak poems in the collection imagine “Deaths everywhere,” in the streets, yet move, a few lines later, to the “two geraniums / In your window-box…his life’s eyes,” 3 a small gesture of poetic hope and human intimacy. While the poems in Discrete Series and elsewhere don’t attempt the impossible task of eschewing historical circumstance to become wholly “aesthetic,” the politics that inform their production are certainly not textually evident. A lifelong Marxist and a decorated literary modernist, Oppen nonetheless found it impossible to live simultaneously as a poet and a Communist. In his 2017 book Writing, Not Writing: Poetry, Crisis, and Responsibility, Tom Fisher expresses Oppen’s dilemma as an extension of two notoriously hopeless claims about the social function of poetry: W.H. Auden’s declaration that “poetry makes nothing happen” and Adorno’s remark that “to write lyric poetry after Auschwitz is barbaric.” 5 For Oppen, he argues, poetry is “not only an ineffective response to social or political emergencies, but is an immoral refusal of, or barbaric response to, an essential social and political responsibility.” 6 By his own account, Oppen gave up poetry “because of the pressures of what for the moment I’ll call conscience.” 7 At the same time, however, his notes and letters problematize this polarized model that keeps literature at a critical distance from politics. 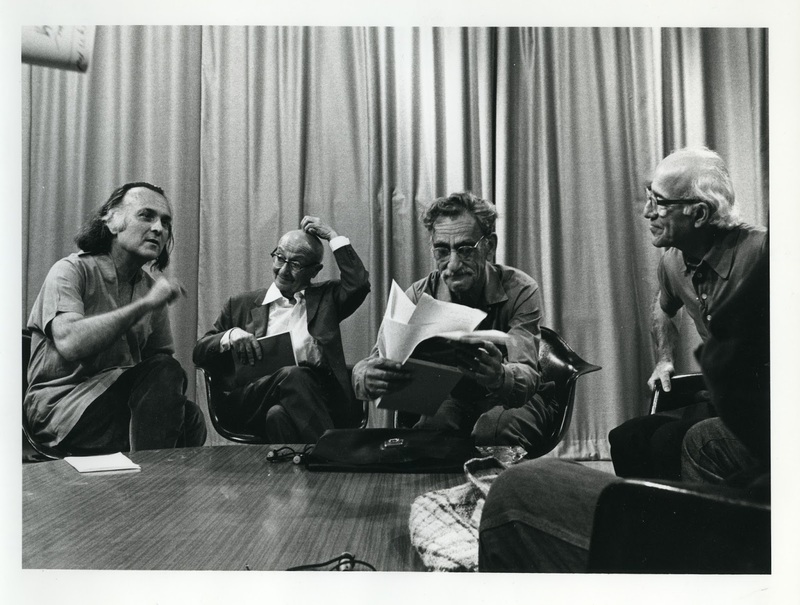 Fisher cites a 1973 letter in which Oppen exclaims: “FROM DISCRETE SERIES TO MARXISM WAS NOT A BREAK––––––––––BY ANY MEANS.” 8 At a later point in the Dembo interview, Oppen also adds that although he wasn’t actively writing poetry, during his silence he “at no time thought [he] wasn’t a poet.” 9 If we take his interview together with the remarks in his letters, it begins to look as if Oppen’s stance on “dilemma of the thirties” was less consistent than we might at first believe: it appears, in fact, that his personal commitment to communism, the force which in 1934 drove the wedge between the practice of writing poetry and Oppen’s “conscience,” also compelled him to return to the poem, twenty-five years later, and write continuously until his death in 1984. While it might not be possible (or even desirable) to reconcile Oppen’s politics with his poetics, their uneasy coexistence in his work allows us to imagine relationships between politic and poem that disturb the binary separating autonomous and committed works of art. Oppen’s civilian life had barely begun before the sharp rightward turn in American politics landed him under the scrutiny of the FBI, which had been monitoring his activities for the better part of a decade. 12 When the House Un-American Activities Committee set their sights on artists and writers, Oppen’s communist ties forced him and his family to Mexico, where they lived in exile until the late 1950s. He broke his silence in 1958 and completed “Blood from the Stone,” his first poem since Discrete Series, published in his 1962 collection The Materials. Two years later he returned to the United States, this time for good, and wrote steadily for the rest of his career. His 1968 collection, Of Being Numerous received the Pulitzer Prize in Poetry; the rest of his oeuvre includes This In Which (1965), Seascape: Needle’s Eye (1972), Myth of the Blaze (1972-75), and Primitive (1978). Poems like Hughes’s “Ballads of Lenin” testify to what Alain Badiou has described as the “essential link” between poetry and communism, a link forged through their shared “concern for what is common to all.” 22 Badiou posits that language is the original “commons” from which poetry derives its communist essence. He further identifies poetry with what he calls “the communist Idea,” a neo-Platonic construction defined outside the “bureaucracy” and “totalitarian regimes” that, according to Badiou, corroded the legacy of Communist states. Badiou makes little reference to “actual communism” and its relationship to 20th-century literature. Distancing himself from “philosophy, sociology, economics, history, [and] political science,” he presents instead what he calls “a proof of communism by way of the poem.” 23 His argument adopts the metaphor of a mathematical proof to conclude that, by being autonomous instances of a common language, all poems are committed to the “communist Idea” irrespective of their content or formal qualities. Badiou’s “proof” resonates beautifully with the poetic and political lives of his exemplary writers, Cesar Vallejo and Bertolt Brecht, in the same way it resonates with the examples of Hughes, Freeman, and Lewis. But as Mark Steven, author of Red Modernism: American Poetry and the Spirit of Communism (2017), has argued, such “abstract formalism” risks divorcing itself entirely from the “historical situations and therefore from the conditions of possibility for actual communism.” In a recent interview with Historical Materialism, Steven points out that although Badiou claims to have demonstrated an “essential” link between communism and the poem, his universalizing “proof” depends upon his use of particular poets whose poems are already highly political. His chosen examples reveal a hidden hierarchy within his essentialist language, one that privileges poets who wrote about communism as “more communist” than those who didn’t versify their politics. This dependency leaves a gap between his theory and its application: adopting this line of argumentation, a critic could cite the work of, say, Ezra Pound, whose Cantos contain effusive praise for Mussolini, to prove an “essential link” between poetry and fascism. Although critical of Badiou’s position, Steven, as well as other leftist literary critics such as Eric Homberger and Rachel Blau DuPlessis, have emphasized the importance of communism to American modernist poetry. For instance, as Red Modernism shows, the poetry of Ezra Pound, William Carlos Williams, and Louis Zukofsky are in continuous dialogue both with Communist states as they actually existed as well as the utopian communist ideal. 24 Similarly, Homberger argues that in “the cultural moment of the mid-1930s…the proletarian literary scene was in high gear.” He cites the explosion of socialist and communist literature, much of which has been forgotten or marginalized, including novels by Robert Cantwell and Edward Dahlber; Kenneth Burke’s essay “My Approach to Communism”; critical texts Literature and Dialectical Materialism by John Strachey and “Notes on Revolutionary Poetry” by Stanley Burnshaw. Finally, perhaps most important to American literary culture, the CPUSA founded the League of American Writers, a short-lived association of playwrights, journalists, poets and novelists dedicated to producing its own canon of proletarian literature. These critics’ materialist interventions suggest that there in fact exists a historical and conceptual—if not quite “essential”—link between the poetry and communism, though not always the most harmonious one. 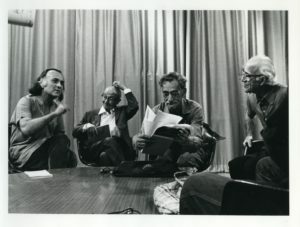 Though Badiou doesn’t mention Oppen in his criticism, his implicit claim that some poets are “more communist” than others might lead him to denigrate Oppen’s work as insufficiently communist: after all, his poetry features no Party rhetoric or exhortations to proletarian uprising, and resists engaging in “the most vigorous and polemical lying for each other’s benefit.” 25 It soon becomes clear that, despite his stated distance from the “realities” of actually existing Communism, the logical conclusion of Badiou’s argument winds up repeating the orthodox position on politically committed art, endorsed by the CPUSA, Comintern, and many communist poets of the 20th century. A significant part of the dissonance Oppen experienced between poetry and politics has to do with this orthodoxy, most salient in the Communist Party’s merging of aesthetics with political ethics. In his essay “Objectivists and Communists,” Eric Homberger explores how after the stock market collapse of 1929, Communist-affiliated poets and literary critics like Edmund Wilson “articulated the need for writers to take sides.” “To earn their place within the Communist literary movement,” Homberger continues, “a harder, more programmatic opposition to capitalism and imperialism was demanded, as was a more direct commitment to put literature at the service of the class struggle.” 26 The Objectivists, in refusing to make their poetry an organ of their politics, became the target of criticism from both “the Communist literary establishment” and those Homberger calls “roughnecks,” poets like Edwin Rolfe and Herman Spector who wrote “immediately satisfying” poetic hymns intended to animate a proletarian class-consciousness. Oppen’s decision to abandon poetry represents the full meaning of what he meant by “conscience,” a social awareness which operates in two directions. On the one hand, as we know, he stopped writing because there exist “situations which cannot be honorably met by art.” 29 On the other, he chose to be silent because the aesthetic demands of the Communist party were too onerous for him to write the kind of experimental verse he felt exhibited the relation between the creative act and communist organizing. Oppen understood that the mistake the Communist Party made lay in its adherence to a narrow definition of the political, one that suffocated those poets whose aesthetic experiments were part of their imagining an alternative to capitalism. It is nearly the same mistake Oppen himself makes when he pits his own poetry against the “Communist verse” of allegedly inferior poets. This conception of communist poetry diverges from Badiou’s essentialism, acknowledging that poems that don’t exclaim their ideologies may still have value as politically radical art. Because “no obvious boundary” divides the poetic from the political, this conception reveals the communist ideal hidden within Oppen’s poetry, opening his political activity to interpretation as a form of poetry. Oppen, in not surrendering to a cynicism that would destroy his ability to write, transforms poetic engagement into the communist impulse so as to preserve them both. The culminating idea illustrated by Oppen’s political poetics is that feeding the poor isn’t a hiatus from literature, but its realization in the world. If it’s not heroic but eminently tragic to sacrifice the poem for the sake of Communism, the miracle of Oppen’s work is to retain his status as a poet, to poeticize politics in its pure form as material action, despite abandoning the formal writing process. Considering this possibility, there may in fact be, as Badiou claims, some essential link between poetry and communism. But perhaps it resides not in any one poem or poet. Rather, the relationship between poetry and communism is a formula that must be – to borrow Marx’s language – demystified and set back on its feet: Rather than make the world into a poem, George Oppen’s example demands the making of the poem into the world. 1. ↑ Claude McKay, Complete Poems, ed. William Maxwell, annotated edition edition (Urbana, Ill.; Chesham: University of Illinois Press, 2008), 178. 2. ↑ George Oppen and Eliot Weinberger, New Collected Poems, ed. Michael Davidson (New York: New Directions, 2008), 30. 3. ↑ Oppen and Weinberger, 34. 4. ↑ L. S. Dembo and George Oppen, “George Oppen,” Contemporary Literature 10, no. 2 (1969): 159–77, https://doi.org/10.2307/1207758. 174. 5. ↑ Theodor Adorno et al., Aesthetics and Politics (London New York, NY: Verso, 2007), 188. 6. ↑ Tom Fisher, Writing Not Writing: Poetry, Crisis, and Responsibility, 1 edition (Iowa City: University Of Iowa Press, 2017). 7. ↑ Dembo and Oppen, “George Oppen,” 174. 8. ↑ Rachel Blau DuPlessis, ed., The Selected Letters of George Oppen (Durham, N.C: Duke University Press Books, 1990), 255. 9. ↑ Dembo and Oppen, “George Oppen,” 175. 10. ↑ Peter Nicholls, “George Oppen in Exile: Mexico and Maritain (For Linda Oppen),” Journal of American Studies 39, no. 1 (2005): 1–18. 3. 11. ↑ Oppen and Weinberger, New Collected Poems, 247. 13. ↑ George Oppen and Eliot Weinberger, New Collected Poems, ed. Michael Davidson (New York: New Directions, 2008). xxvi. Peter Nicholls, “George Oppen in Exile: Mexico and Maritain (For Linda Oppen),” Journal of American Studies 39, no. 1 (2005): 1–18. 14. ↑ George Oppen and Eliot Weinberger, New Collected Poems, ed. Michael Davidson (New York: New Directions, 2008). xviii. Oppen and Weinberger, New Collected Poems. 15. ↑ Oppen and Weinberger, xxii. 16. ↑ Louis Zukofsky, Louis Zukofsky: Selected Poems:, ed. Charles Bernstein, First Edition edition (New York: Library of America, 2006). 17. ↑ Cary Nelson, Repression and Recovery: Modern American Poetry and the Politics of (Publisher, 1989), 62. 20. ↑ ehine, “The Ghetto by Lola Ridge - Poems | Academy of American Poets,” Text, The Ghetto, March 7, 2016, https://www.poets.org/poetsorg/poem/ghetto. 21. ↑ Langston Hughes, The Collected Poems of Langston Hughes, ed. Arnold Rampersad, Annotated edition edition (New York: Vintage, 1995), 183-84. 22. ↑ Alain Badiou, The Age of the Poets: And Other Writings on Twentieth-Century Poetry and Prose, trans. Emily Apter and Bruno Bosteels (London ; New York: Verso, 2014). 25. ↑ DuPlessis, The Selected Letters of George Oppen, 64. 26. ↑ Eric Homberger et al., The Objectivist Nexus: Essays in Cultural Poetics, ed. Peter Quartermain and Rachel Blau DuPlessis, First edition (University Alabama Press, 2015), 111-112. 27. ↑ Eric Homberger et al., The Objectivist Nexus: Essays in Cultural Poetics, ed. Peter Quartermain and Rachel Blau DuPlessis, First edition (University Alabama Press, 2015), 124. 29. ↑ DuPlessis, The Selected Letters of George Oppen, 65. 30. ↑ Nelson, Repression and Recovery, 171. 31. ↑ Oppen and Weinberger, New Collected Poems. 52. 32. ↑ Rachel Blau DuPlessis, “‘The Familiar / Becomes Extreme’: George Oppen and Silence,” The North Dakota Quarterly 55, no. 4 (1987): 18–36. 33. ↑ George Oppen, George Oppen: Man and Poet, ed. Burton Hatlen, 1st edition (National Poetry Foundation, 1981). 25. 34. ↑ Oppen and Weinberger, New Collected Poems, 332. 35. ↑ In fact, the quotation is not Adorno’s, but Adorno quoting German literary critic Hans Magnus Enzensberger.